Hi girls! I hope your week had an amazing start- right now, I'm getting psychologically ready to spend more than 12 hours at the university every Tuesday. I wore this to have lunch with some friends at a sushi placed in Miami called Umami (amazing food, and great prices... yes, I'm a sushi lover). We were supposed to go last week for Gabo's late bday celebration but I was in Chile. About my outfit, as soon as I saw the pics.. I got a retro vibe- probably because of the corduroy shorts, the tie-up shirt and the platforms (it reminded me of these high school pics from 1969, which I absolutely adore!). I wanted to pair these mustard shorts with some navy platforms and a simple bag for a laid-back/casual look (oh btw, the bag, from Inverted Commas, is made of organic bottom and hand painted). I hope you like the outfit! Thanks for stopping by! Hola a todas! Espero que su semana haya empezado cheverísimo, yo me estoy preparando psicológicamente para pasar más de 12 horas en la universidad todos los martes. Esto fue lo que usé el fin de semana para almorzar sushi con unos amigos- que nos habían invitado por el cumpleaños de Gabo hace unas semanas (pero se tuvo que posponer un poco porque estuve en Chile la semana pasada). Sobre mi outfit, apenas lo vi en las fotos.. me dió una vibra retro por lo alto de los shorts y la tela de pana + la camisa amarrada + plataformas (me recordó a estas fotos de gente en el colegio en 1969). Quise combinar el short mostaza con unas plataformas azules y una cartera sencilla para que tuviera un aire más casual (por cierto; la cartera, de Inverted Commas, es ecológica y hecha a mano!). Espero que les guste, un abrazo a todas! Those colors look super pretty on you, Dany! gorgeous! I love the shorts!! Very cute I really like the yellow shorts! I love the cutout detail of that top - you look fabulous! I understand those long hours at the uni - hang in there. Simply love your blog. Its amazing truly. I wait daily to check on your blog if there are any new posts :) Your style is perfect! So much to learn from you. Would appreciate if you visit my blog and drop me a feedback. Fabulous look...definitely feeling a little 70's/80's which I think is great. 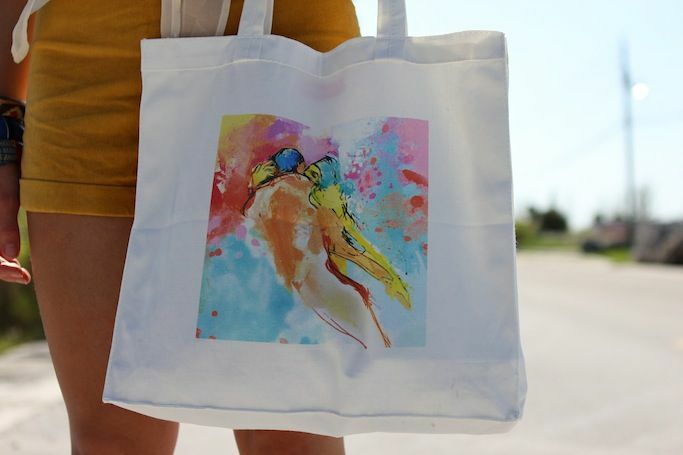 And the abstract print on the bag is beautiful, I'd hang that up in my house. lo mejor del look es la camisa!! Not many people can pull off high waist shorts like this, you look absolutely adorable!! And I love the colors together. absolutely adorable! love that you tied the top! me encantan esos shorts Dany! ¡Qué linda! Me encantó la combinación de colores y la vibra retro que le diste al look :) Saludos Dany. I adore your short and top! Me gusta mucho el look!! la camisa es genial y el tono del pantalon me encanta!! los zapatos tambien muy bonitos! chicas hoy en mi blog lamaryeta.blogspot.com hago un repaso al estilo de Diane Kruger, si quieren opinar o dejar cualquier comentario ya saben! i love the mustard corduroy shorts for spring! Me gusta el toque retro que le dan los shorts! Las cuñas, preciosas! Ahhh, que pasada, me miré tu blog enterito che, sos preciosa, te robaba el armario entero. Otra fan más que te podés ir sumando, porque por acá me voy a pasar muuuuy seguido. Por cierto, me recordas a Jodie Foster en Taxi Driver, solo te falta la pamela. Un besito. Wow those shorts are amazing! You look hott :) Gorgeous dear! I'm following you, if you like do the same! Adore that tote! Went to check out the Etsy shop and now I want them all. I am always so jealous because of the nice weather you have ! como siempre, divina!!! me encantaron los zapatos... muy bien!!! I love the outfit! !<3 but I thik that if you took that bag off,it would it been even more amazing! What a lovely tote! I also love the shoes... sure retro! I really love your blog and style! You're so cute! I'm following you right now! I hope you will stop by my blog and follow me back!